The sashes in solid frames may be hung in several ways. The lower sashes are usually hung by the styles on butts, and to open either outward or inward as desired. This is called "Casement hung." Fig. 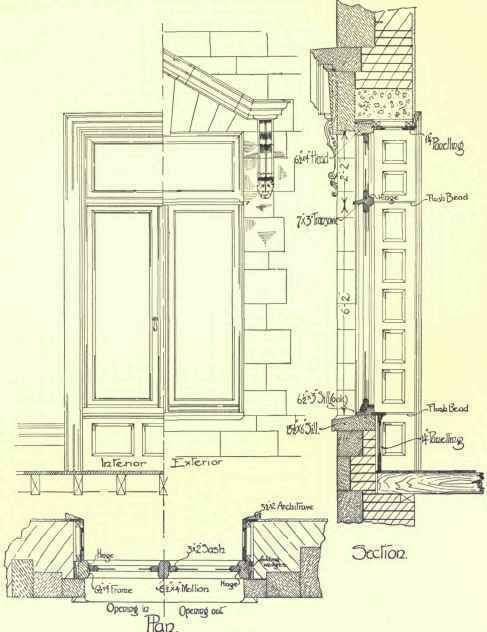 135 shows the construction of a casement window in which outward and inward opening sashes are illustrated, together with an inward opening fanlight. In frames containing transoms the upper sashes, when fitted with butts, are generally hung by the bottom rail, and open inwards; when hung by the top they open outwards; and when on centres, the top falls in and the bottom out. They are actuated from the floor by means of cords, and there are various patterns of openers and stays. One of the most approved consists of a worm wheel and rack stay bar, by means of which the sash may be gradually opened and fixed at any required position. The general difficulty experienced with casement frames is in making them weathertight. This is more particularly the case when the sashes open inward. When opening outward, the bottom bar may be check-throated and be cut to fit the weathering of sill, and an additional weather board is sometimes fixed to the bottom bar. Fig. 136 shows some methods of fitting an outward opening casement. 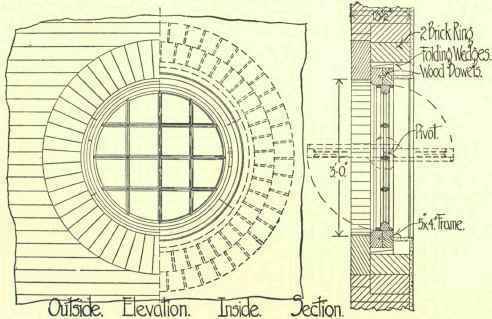 When opening inwards, the bottom bar must necessarily clear the highest point of sill, so that the above weatherings cannot be adopted, while another point that has to be considered is that the wind has a continual tendency to force the sash open. Fig. 137 shows two methods of fitting the bottom bar for inward opening. A shows all the construction of wood. 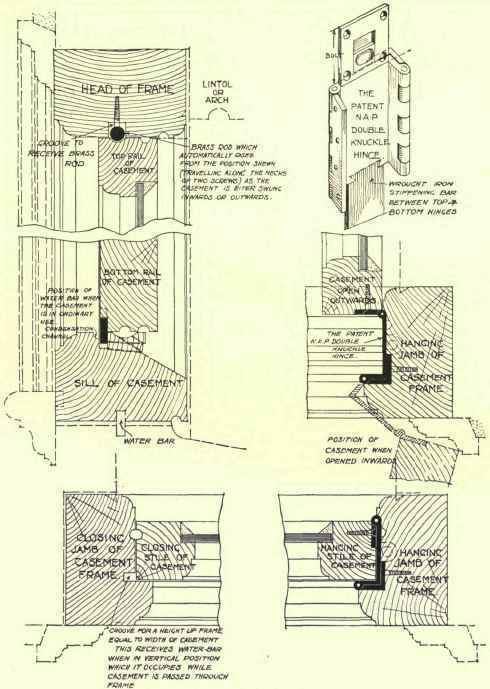 Here a double check is provided, so that any water driven beyond the first groove drops into the second and is carried off through the weep holes, which are indicated by dotted lines. Several of these holes are made in the length of the sill. At B a metal bar with a hinged flap is shown. This bar is screwed to the sill, and when the sash is open the flap lies closed. When the sash is closed this flap is caught by the hook attached to the plate, which runs the full length of the bottom bar and is raised to the position shown, thus excluding all wet; but it may be mentioned that exact adjustment, such as is rarely maintained for long with framed timber, is necessary for this to act properly. The meeting style of casement sashes should be closed with what is known as a "Hook Joint," such as is shown at C. It is superior to a bevel rebated joint. Care must be taken when this joint is used that the rails are double tenoned into the meeting styles, so that the hook may be worked between them. If a single tenon only be used, the hook would cut through the end of it, which would then break off. Bulls Eye Light (Fig. 139). In this the frame is circular, the usual method of construction being to cut the circle in three segments, jointed with hand-rail bolts; it is made in two thicknesses, which are fixed to break-joint. The sash is also made in segments, and the guard beads may, if the diameter is small, be cut in two semicircles from a wide board, or be steamed and bent to shape. If required to open, the sash is hung on pivots, the upper part of the inner bead being attached to the upper half which falls inwards, and the outer bead having its lower part attached to the lower part of the sash. This is a term applied to a frame fitted with several sashes, fixed one above another, and hung by the bottom bars, so that either or all may be opened for ventilation as desired. The name originates from the fact that this class of light is largely adopted in hospitals. They are sometimes called " Hopper Frame Lights." Yorkshire Lights consist of a long low frame having one or two mullions. If one mullion, a sash is fitted to one half of the frame and made to slide horizontally on runners, the other half having the glass fixed in the frame. If two mullions are used the sash is generally placed in the middle, the outside lights being glazed direct in the frame. Cases frequently occur where it is necessary to provide windows, or lights, in the roof of a building, and this may be accomplished in one of three ways,-namely, by means of Dormer Windows, Skylights, or Lantern Lights. Dormer Windows vary only from those previously mentioned in that they are placed in a special projection, or Dormer, formed in the roof. Cased sash frames or solid frames may be used, and the details of construction are similar to those before described for each class. Preparation for dormer windows has to be made when the roofs are constructed by the insertion of trimmers.